The history of Cold War era American social science has been ably documented in a new edited collection, Cold War Social Science: Knowledge Production, Library Democracy, and Human Nature. Edited by historians Mark Solovey and Hamilton Cravens, the volume includes contributions on linguistics, social relations, anthropology, psychology, as well as the social sciences more broadly, from a number of accomplished scholars. The volume, comprised of three sections, on knowledge production, liberal democracy, and human nature, respectively, is described as follows. From World War II to the early 1970s, American social science research expanded in dramatic and unprecedented fashion. This volume offers fascinating perspectives on the rise of U.S. practitioners as global leaders in the field, exploring how, why, and with what consequences this rapid and yet contested expansion depended on the entanglement of the social sciences with Cold War politics. Utilizing the controversial but useful concept of ‘Cold War social science,’ the histories gathered here reveal how scholars from established disciplines and new interdisciplinary fields of study made important contributions to long-standing debates about knowledge production, liberal democracy, and human nature. 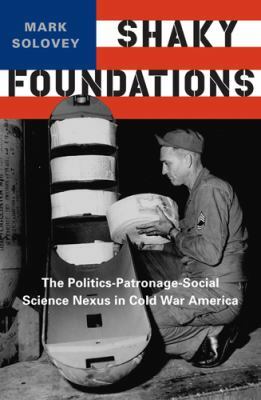 University of Toronto historian of science Mark Solovey has just released a new book, Shaky Foundations: The Politics-Patronage-Social Science Nexus in Cold War America. This book examines the history of the social sciences in America during the Cold War through the lens of the patronage system, tracing how certain agendas dictated the direction social science research took. This book is a continuation of Solovey’s research interest in social science in America in the period after World War II. Numerous popular and scholarly accounts have exposed the deep impact of patrons on the production of scientific knowledge and its applications. Shaky Foundations provides the first extensive examination of a new patronage system for the social sciences that emerged in the early Cold War years and took more definite shape during the 1950s and early 1960s, a period of enormous expansion in American social science. By focusing on the military, the Ford Foundation, and the National Science Foundation, Mark Solovey shows how this patronage system presented social scientists and other interested parties, including natural scientists and politicians, with new opportunities to work out the scientific identity, social implications, and public policy uses of academic social research. Solovey also examines significant criticisms of the new patronage system, which contributed to widespread efforts to rethink and reshape the politics-patronage-social science nexus starting in the mid-1960s. Based on extensive archival research, Shaky Foundations addresses fundamental questions about the intellectual foundations of the social sciences, their relationships with the natural sciences and the humanities, and the political and ideological import of academic social inquiry. The March 2012 issue of Isis, the official journal of the History of Science Society, is now online. Included in this issue are a couple of articles of interest to historians of psychology. In “Senator Fred Harris’s National Social Science Foundation Proposal” Mark Solovey explores efforts to reform American social science funding during the 1960s. Additionally, a special Focus section in this issue explores the role of textbooks in the sciences. The section itself is introduced by Marga Vicedo, who then goes on in a separate piece to discuss textbook depictions of Harry Harlow’s research with rhesus monkeys. (AHP’s previous posts on Harlow’s work can be found here.) Full titles, authors, and abstracts follow below.